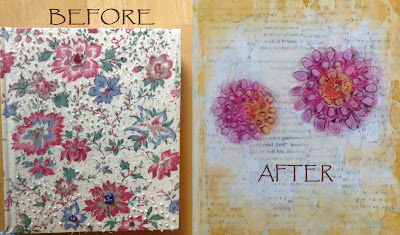 Here is one of my altered journal projects. I was drawn to this particular journal because it came with a cover that screamed for a make-over. I just love “before” and “after” projects. You can also use the steps to make a mixed media piece of art, just use a piece of wood, canvas, metal, or even cardboard instead of a journal. Step 1: Preparing the journal for layering. I had an additional step of removing hundreds of tiny beads that were sewn onto my journal cover. 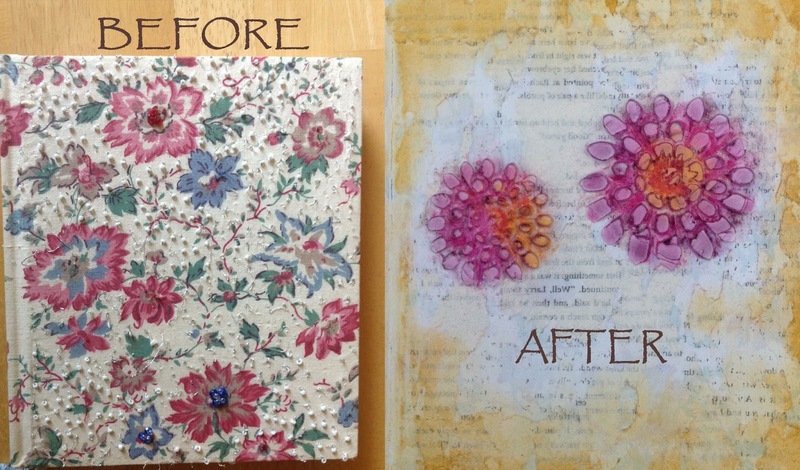 I then painted two heavy coats of Gesso on the front and back of the journal. I wanted to completely hide the 1980’s flower motif. Also, those beads did a bit of damage to the cover and I needed to minimize that problem. Step 2: Image Transfer. Cover the front of your journal with Regular Gel Medium (I like Golden). Lay pages of a book down on top of the Medium. Burnish the pages (rub something like a credit card across the pages). This will help the page(s) adhere to the journal. Wait 1 to 5 minutes to start peeling the page(s) off. On a hot day, it will only take a minute. Cooler days will take longer. I pull up a corner and see if I like the effect. If not, I’ll burnish the page again and wait a few more minutes. While you peel your book page up, some of the page will adhere to the journal, making an interesting layer. If you feel too much text has been transferred, simply rub off what you don’t want with your fingers. If not enough has transferred, simply do the image transfer again. This step creates amazing texture. Step 3: Stenciling with Modeling Paste. I used Liquitex brand for this step (you can also use other brands, such as Golden). Place the stencil you want to use on your journal. Using a palette knife, apply a thick layer of the paste to your stencil. Lift your stencil up and immediately wash it. All brands of molding paste will destroy your stencil if left too long (I speak from experience). Let the molding paste dry for 24 hours. Step 4: Chalk Pastels. It’s time to add some color. I enjoy this step the most as you get to watch your piece of art come to life. I use cheap make-up sponges for this step. Load your sponge by rubbing it against a piece of chalk pastel. Next, wipe the sponge onto your journal, wherever you want color. I used a golden yellow around the outer edge of my journal. I then used orange and fucshia for the petals, and violet for the petal tips. Step 5: Final Touches: For my final touch, I used green acrylic paint for stems and leaves. Step 6: Time to seal. Finish your project with a sealant like Krylon Crystal Clear. Spray finishes must be used outdoors. Side Note: I did this project two months ago. 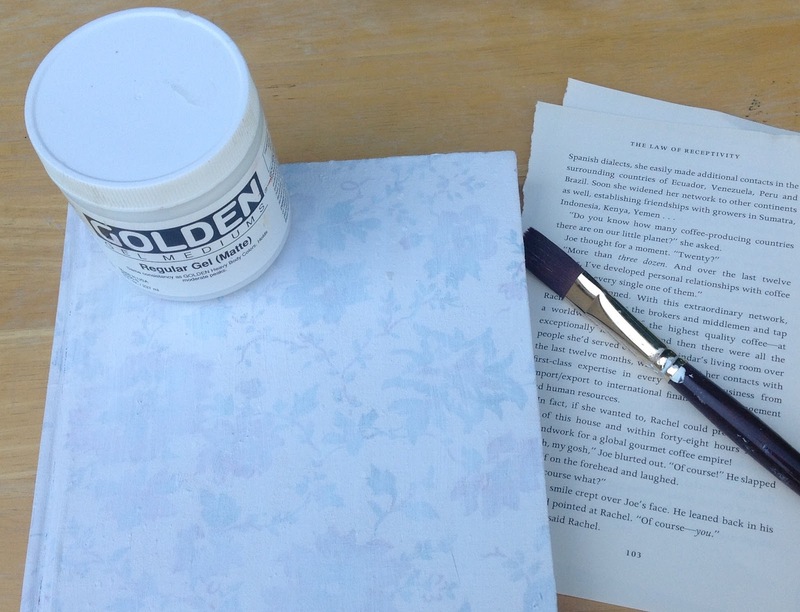 Before I posted the project, I wanted to test the durability of using molding paste on the front of a journal. I'm happy to report that I've been using my journal daily and the flowers have not chipped. I’ve been having fun creating cabinet card collages. Cabinet cards are vintage photos taken by professional photographers in the late 1800’s. 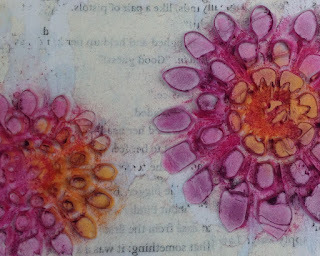 They are extremely thick which makes them perfect for mini collages as they absorb paint without wrinkling or warping. To make a collage using cabinet cards, you use the same collage techniques you would use on any other project. Just a reminder, you must use transparent paint so that you can see the layers underneath. I used watercolor paint. You can find cabinet cards on eBay, Etsy, antique stores, estate sales and flea markets. If you’re looking for cabinet cards in an antique store or flea market, they can usually be found in a box of vintage photos. This is where you can get them for the best price. The best cabinet cards for this project will have a white background. If your cabinet card has a dark background, the project becomes more difficult. I purchased this cabinet card because I fell in love with the angelic faces of these children. Unfortunately I didn’t pay attention to the background. I’m going to paint the background white and see if I can make it work. I love the look of depth from layered backgrounds. 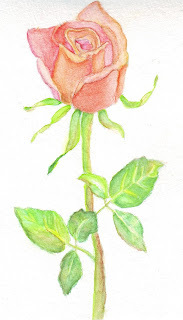 When trying this technique, you must use transparent versus opaque paints. How do you know if a paint is transparent or opaque? Several paint brands, such as Golden, make it easy to see how transparent their paints are. On their label, they have a brush stroke of paint coated over black lines. If you can see the black lines through the paint, the color is transparent. If it’s hard to see the black lines, that paint is opaque and you won’t see any layers underneath. Learning about the black lines was an “A-ha” moment for me. Very handy to know. This orange paint is transparent as you can see the black lines through the paint stroke on the label. The blue pain is opaque because it's hard to see the black lines on the label. You don't want to use this paint to build layers as you won't be able to see any layers peeking through. Your background will turn into one color only - blue. I created the background above by using a circle stencil. I paired the stencil with different opaque paints (orange, red and yellow). I built up layers by stenciling on top of previous layers.